Is the Renegade Gardener Dead? 8-1-06 – Heavens no, though many early mornings when I rise to darkness and the six Advil have worn off, I feel like it. A sincere thank-you to the many comrades who have e-mailed over the last, oh, six weeks or so (you ARE getting more patient over the years) to enquire when I might be tempted to update the site. Well, you’ll get a new article here in a minute, but I do owe an explanation to all you wonderful RGs out there as to why the site has been dormant since May. Three factors: First, work. That’s the good news. I am now running a five-person landscaping company that has clients and jobs stacked up higher than concrete retaining wall block in Blaine. For those of you readers who live outside the Twin Cities, that’s a funny line. Blaine is sort of … oh, never mind. I’ll be using some of these projects for the basis of the next, lavish update, which will be coming sooner rather than later, I swear. We take the projects one at a time, but this season they’ve never stopped, and some are bigger than previous years. Second is baseball. I coach youth baseball, nine years in a row now, a crazy, crazy thing to do considering that six years ago I dropped out of the corporate rat race to pursue my passions for landscaping, gardening and writing. But I can’t give it up, it’s a pure and simple joy, and the past four years when I’ve been asked to coach I say “no,” and then they ask again in about a week and I say, “sure.” The Babe Ruth season (14 and 15 year olds), which began with practices in April, recently ended. Third factor is of a personal nature, non-health related, but in terms of time and, shall we say, logistics, it too has made it difficult to devote attention to updates. And similar to a baseball game, this long, drawn-out affair will also ultimately be decided, and then it’s over. I’m thinking by about September, early October, tops. “Proper” garden writing, I guess you’d call it. The article below is one of those. Interesting enough, I suppose, if you’re curious about dahlias. The second type of update is where I sit and write just for the love of the site, often late at night when my mind is racing and I’m pulsing to the backbeat of Dylan, Coltraine, White Stripes, Neal Young, mid-80s NWA, the Kinks, or the like (the new Ray Davies solo album, “Other People’s Lives,” by the way, is FANTASTIC. Just saw Ray a month ago at First Ave., 61 years old, good little backup band, singing his guts out). These are the times when I often do full updates, Top Pick, Myth of the Week, etc. These are the times to which I soon shall return. The photo, by the way, is one I took of one of the redbuds (Cercis canadensis Minnesota Strain) in my landscape in Deephaven, Minnesota. I thought it was kind of cool. Gardening is a delicious addiction, as every gardener knows. The hobby seduces the senses one by one: the sight of colorful blooms, the sound of wind, water and wildlife, the feel of sun-warmed earth, the taste of garden grown fruits and vegetables, the heavenly fragrance of it all. Become hooked and the craving for new gardening challenges grows. Some go the way of the water garden, while others pursue the perfect lawn, but perhaps the most common love affair for gardeners is with a particular perennial plant that has piqued their passion. You probably know one on your street, or in your neighborhood: the rose devotee, the hosta zealot, the iris buff or the daylily fanatic. Orchids, it should be noted, are one of most dangerous plants on the planet; they consume people. There is one plant, however, that seems somehow to illicit unrivalled allegiance from its advocates: the Dahlia. Catch a glimpse of just one in bloom, and you’ll swing open a stranger’s gate to get a closer look. View the intoxicating scene of hundreds in bloom, and heaven help you. Ringer had spent “quite a while” in the landscaping industry, and was looking for a market niche-type plant to grow. “I was burning out from creating gardens for other people, and then maintaining them. I tried growing and selling medicinal herbs, but the market for them wasn’t there,” she says. Alert to the fact that dahlias were a specialty plant not readily available to northern gardeners, she evicted the herbs from her greenhouse and began dancing with dahlias. “I call dahlias the poodle of the flower world—dahlias have to be groomed, and attended to on a weekly basis. For some dahlia lovers, daily would be more like it!,” says Ringer. Dahlia stems are brittle, and plants can blow over and snap easily in the wind, the reason dahlia aficionados stake each plant. Disbudding is another trick of the dahlia trade. To grow proper dahlias, one needs to break off certain buds as they form in summer, so that the plant will devote its energy to a chosen few. This creates larger flowers and a plant that is well proportioned without becoming too top-heavy. Then there’s the fact that dahlias are not hardy north of their native Mexico. A tuberous plant, dahlia tubers are religiously dug up each fall by local gardeners and stored until spring (see sidebar). Bear in mind also that despite their large blooms, dahlias will add no fragrance to your property (although as Ringer notes, “I’m grateful they have no fragrance, or it would be too much!”). Over four hundred blooming dahlias will greet visitors this September when Lisa Ringer welcomes the public to the forty-acre Two Pony Gardens during her annual open house. The timing of the event suggests another reason why more and more local gardeners are becoming hooked on these fussy prima donnas: Dahlias bloom in the fall, joining the relatively short list of flowering plants that bring fresh color—lots of it—to the garden. It’s as if these excessive, exotic, brazenly colorful behemoths of the flower world knowingly save the best for last. For those gardening addicts out there who are still seeking that ultimate thrill, growing dahlias may be your final destination. 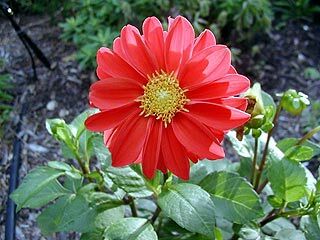 Most dahlia varieties require full sun though a few will tolerate part sun. Soil should be slightly acidic (ph 6.2-6.8), MUST have good drainage and should contain organic matter. Tubers can be planted mid- to late May provided the soil temperature has reached sixty degrees. Plant tubers an inch deep, on their side with eyes (green, swelling buds) pointing upwards, eighteen to twenty-four inches apart. Do not water until sprouts appear above ground. Water newly planted dahlias deeply every two weeks, weekly when it’s very hot. Established dahlias should be watered weekly, more frequently when very hot. Fertilize lightly a few weeks after planting and again one month later. 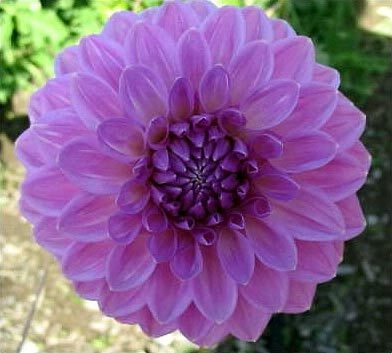 Dahlias require a low nitrogen fertilizer, granular vegetable fertilizer works well. Many dahlia growers prefer organic fertilizers to avoid risk of burning tender new tuber roots. Use granular, not water-soluble, fertilizers. To reduce height and grow bushier, more flower-filled plants, pinch back new growth when dahlias are one foot high. If your goal is taller plants with larger flowers, remove all side buds at the end of each branch through the growing season (disbudding). 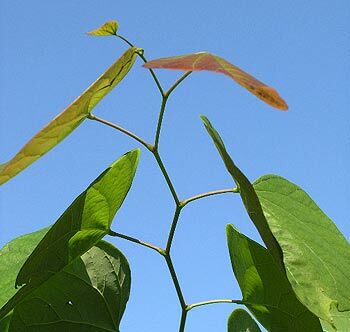 For tall varieties, place a stake near each tuber and gently tie plants to stake as they reach thirty inches in height. 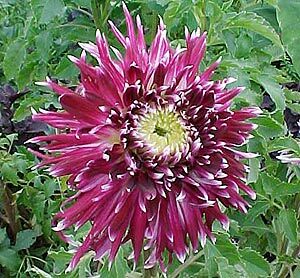 Dahlias are not winter hardy; tubers must be dug in fall and stored over winter. After a hard freeze in fall, cut plants down to the ground, then gently dig up the tubers using a perennial fork. Clean tubers of all soil with spray from a garden hose, then allow to dry for a day in a cool, dry place. Divide tuber clumps into individual tubers using a clean, sharp knife. Be sure each tuber you store has at least one eye (new growth bud). Place tubers in a bed of peat moss, sawdust, or vermiculite, inside a box with a lid. Styrofoam coolers and waxed banana boxes from the grocery store work well. Very lightly water the top layer of the storage medium. Note variety on each lid, or tag each tuber. You can also write the variety name directly on the tuber with a Sharpie. Now the trickiest part: boxes must be stored in an area where the temperature is around forty-five degrees. Even the concrete floor of your basement will be too warm, and the tubers will rot. Stored in the garage they will freeze. A heated garage maintained at forty-five degrees is perfect. Some dahlia lovers crack a window in the basement, use crawl spaces, or purchase refrigerators just for dahlia storage. Check tubers monthly. If they appear to be drying out (wrinkling, shrinking) lightly mist tubers and growing medium.